Clock : incorrect date format in FR in Unity panel …bionic. System language and regional settings are set to French. which is correct for French. which looks more English than French order. Any config file I might edit to make my clock « more French » ? For me it works though. What is the output of `locale` ? It is possible that indicator-datetime is not building with language packs. Do you have "french" installed? If not you can install it from System language and regional settings. Also check if you have geoclue installed. Ah I forgot, For your own custom time format, you need to first set `time-format` from 'locale-default' to 'custom'. in panel indicator i have: "jeu. août 16 13:15"
in calendar i have: "jeudi 16 août 2018"
in terminal, date: "jeudi 16 août 2018, 13:17:44 (UTC+0200)"
i don't have "/com/canonical/indicator" in dconf ? ? ? Thank you Khurshid Alam that's exactly what I was looking for ! That does not fix the default clock non-matching the locale clock settings but it allows to have a customized clock. I tested this day with a LiveUSB Cosmic Cuttlefish (Gnome-shell): same bug. Since it is happening in other sessions it could be bug in language-pack or some other package. 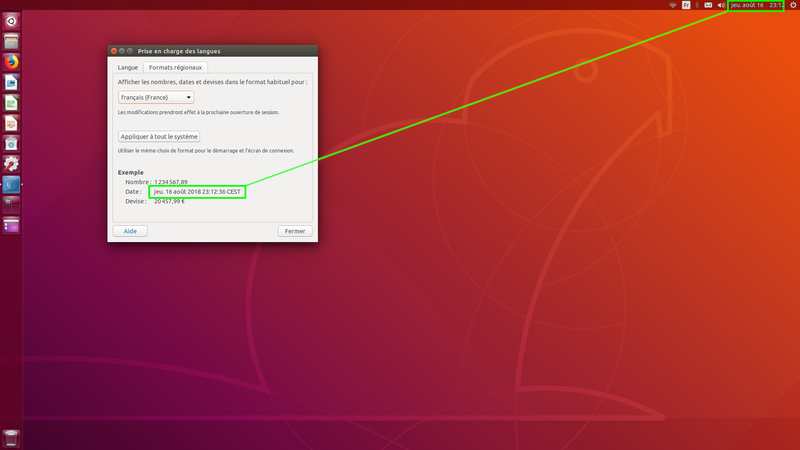 Ubuntu: Clock : incorrect date format in FR in Unity panel …bionic.